Nearly 30 years after Orson Scott Card's "Ender's Game" began its quest towards sci-fi classic status, the film adaptation has finally been made. It's been an arduous trek for the project, one that's started and stalled a number of times, but it evidently took fans of the novel to grow up and begin making movies before the cinematic version could be done right. 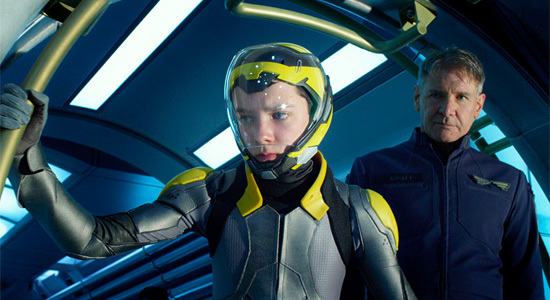 Ender's Game may not be a perfect adaptation of Card's novel. It moves with a haste that screams "adaptation of a larger work," but the film as is is quite stunning. Aided by superb performances and some of the very best digital effects seen in recent years, Ender's Game may not be an ideal adaptation, but it's hard in this age of Hollywood product not to admire what they've done. Written for the screen and directed by Gavin Hood, the film takes a literal approach in its adaptation of Card's work. When the story opens, 50 years have passed since the Formics, an alien race, first invaded our planet. Due to the top-notch piloting of Mazer Rackham, played by Ben Kingsley, the Formics were held at bay, but the planet, under protection of the International Fleet, prepares for the aliens' return. Enter Andrew "Ender" Wiggin, played by Asa Butterfield, a young trainee bullied for his status as a "third" in the two-child society. Valentine, Ender's sister played by Abigail Breslin, is loving, his brother, Peter, played by Jimmy Pinchak, is a fighter, and the young boy must contend with the dueling emotions that run through him. It's in this conflict that Colonel Hyrum Graff, played with suitable gruffness by Harrison Ford, sees potential in the boy, a way to train him in order to take the fight to the Formics and end the threat once and for all. Ender is inducted into Battle School, a floating space station of an academy that will give the young boy all the tools he will need if he is to be victorious against the Formics. But Ender's loving side, the side that wishes to learn about an opponent before he faces them, creates yet a deeper conflict for the war he's about to fight. Direct adaptations - or, more appropriately, literal adaptations - don't often work. Baz Luhrman's The Great Gatsby from earlier in the year is proof of that, but Ender's Game is a story that hasn't been told before on the big screen. A literal adaptation works well here, because despite the popularity of Card's novel, it's not something we've seen before. Hood does a fine job adapting the novel, including more subplots and nuances than one might expect. There's an obvious rush to everything within the film, some scenes bringing their respective drama to the forefront a few minutes too early. There's little room to breath here, particularly in some of the more important character moments. Ender's relationship with his siblings and with Graff are well established, but the same cannot be said for the time given with his classmates at Battle School. Hailee Steinfeld plays Petra, who ends up being Ender's best friend while at the school, and though her moments that are necessary for the story all play out as they should, there's very little in the way of genuine development between the two. That could also be a side effect of the lack of chemistry between the two actors. However, it's difficult to notice an emptiness between characters when everything else about Ender's Game is filled to the brim. Hood not only handles the adaptation with a solid hand, his direction for the story and the vision he brings to the table is both audacious and awesome. The camera moves through the Battle School, floats outside around the space station, and digs into the heart of the action like a massive force of precision, always giving us the utmost impact but never allowing the beauty of the digital effects to overshadow the drama. Those effects, by the way, are impeccable. There's a reason Digital Domain's logo at the beginning of the film is so appropriate. Much of the CGI found in Ender's Game is seamless around the actors and sets, to the point that the photorealism of it all draws you into the story even further. The hand they have in making the action sequences all the more real is undeniable, the marriage of digital effects and stunt work on display in the Battle Room scenes making them a highlight. So, too, can be said for Ender's Mind Game, a digital world where Ender is represented by a rat on a large quest for some unknown prize. It's a subplot that could have easily been cut, but Hood incorporates it to its fullest potential, understanding the importance of the story as well as the digital flourishes. But those digital flourishes and even the impressive adaptation of the story would be for naught if it weren't for a stirring lead performance. Butterfield is absolutely up for that challenge, and his Ender is a character both sympathetic and worthy of being feared. The young actor matures before our eyes, and though that's a shared aspect to most war films, it's hardly ever done with such subtlety and force working in tandem. Butterfield's performance makes Ender's inner conflict just as engaging as the outward battles he fights. His supporting players all work their magic magnificently, as well, chief among them being Ford. Graff could have easily been played more as the antagonist, the personification of Ender's ability and desire to act out against those who threaten him. While the character does end up being that, Ford's charisma adds an almost tranquility to Graff. It's his best performance in years, and one that sees his age and stone-like coarseness as something to use, not something to get around. It's nothing new for a film based on a novel to feel clipped, and though those issues found in Ender's Game are noticeable, they rarely ever take away from the excitement or entertainment Gavin Hood injects into his film. His Ender's Game adaptation is one crafted from an admiration for Card's original novel, one that recognizes the potential to depict both amazing battles in space as well as the engaging themes that make this such an interesting coming-of-age story. It's a futuristic story but one so perceptive and even prescient that it remains an important one for the youths of today. Thank God someone realized and executed Ender's Game as well as it could have been done. Now, if only it could have been 20 minutes longer. ...whoa, high praise. Can't lie, expected a dismal review based based on my preconceptions of the film. Bit of a reminder to keep an open mind I guess. Might check it out this weekend! Yes, First Showing obviously included BOTH the ups AND downs, but explained them with a neutral, non-biased perspective. I very much enjoy those kinds of reviews! You see all the angles, not just one or two slightly biased perspectives. "Aided by superb performances and some of the very best digital effects seen in recent years" Did we see the same movie? I utterly and completely disagree with these comments! The acting was quite poor despite a cast with incredible pedigree. The VFX were not very good at all. A few scenes were alright, but overall I thought they were disappointing. Digital Domain was an investor on this movie and should have had more motivation that usual to pull every trick they could out of their hat, instead they phoned it in. I give it a 4/10. The biggest problem with Ender's Game is the movie length. The movie needed about an extra hour of footage to really develop the politics and character backgrounds. This review is just as bad as the movie, which was unbelievably ignorant to the very essence of the story written by Orson Scott Card. If only I had known Gavin Hood also directed X-Men Origins: Wolverine. He's no Kubrick, who took a great story (The Shining) and changed it in a genius way, or Peter Jackson, who brilliantly took novel's twice as deep and turned them into classic movies. I threw my drink cup and walked out, yelling. 0/10. Haven't read the book, but was thoroughly entertained by the movie. I thought it was well done.